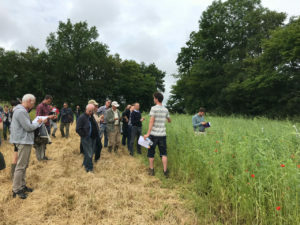 For 3 Days participants exchanged knowledge about organic seed production in Maisse, France ( 4- 7 June 2018). 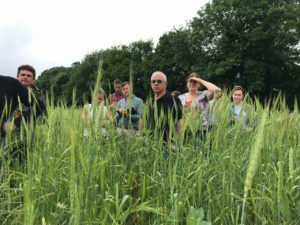 The organic seed producer UBIOS opened its doors to 20 participants from all over Europe. 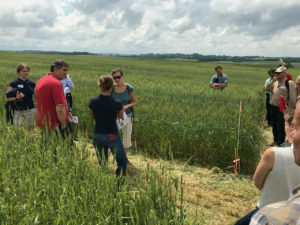 ITAB invited seed producers from Bulgaria, Romania, Poland, Hungary, Spain, Portugal, Italy and Greece which had the chance to visit the seed cleaning station, talk to farmers who produce cereal seeds and to share their knowledge with each other. The practice of one young famer to use intercropping in seed production (faba bean x wheat) was inspiring. The concept of these Cross-Visits is to enable mutual learning process amongst professionals engaged, inspire and stimulate regional partners to initiate changes in their systems, forge relationships as a basis for a professional network that can sustain after the project period. 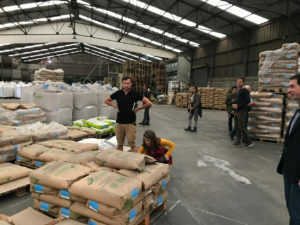 This task is coordinated by IFOAM EU within the LIVESEED project. More visits are planned in the Netherlands, Italy and Germany in 2019-20. A short report and practical material on organic seed production will be published on this website.